I went through the wringer. I had thyroid eye disease, had radiation on my temple and had to have orbital reconstructive eye surgery. I had never heard about thyroid disease. I have hypothyroidism and have Graves' disease. I have never been on a correct dosage, it works for a year and then I have to go through a lot to get a correct dosage. It has been terrible for me. I can go a year or two but the doctor is always lowering the dosage or ups the Synthroid. When it is too high or low I have to struggle to get back on the right level. She couldn't figure out why she was losing weight. Her hair was falling out, and the 27-year-old was so tired, she sometimes crawled up the stairs to get to her apartment. It would be three years before an astute primary care physician thought to run a blood test to check out her thyroid hormone levels. Her TSH (thyroid-stimulating hormone) levels were very low, while her other thyroid hormone levels (serum thyroxine, or T4, and triiodothyronine, or T3) were way up. I realized that I was not alright when my whole body itched without rashes. My son told me that it can be due to kidney, liver or thyroid problem. I went to a doctor and got my blood test done. I was told that it is hyperthyroidism and high liver enzyme. The symptoms I have are sore throat, itch, tiredness, sleeplessness, my fingers tremble, neck aches, and I have cold sweat and nausea. I am given medicine for finger trembling and to handle the hyperthyroidism. I need to do a few blood tests and scanning to confirm that my liver is not affected due to virus attack. I have been diagnosed with Graves' disease. Two years ago I started to have vision problems due to Graves'. I have had two surgeries on my left eye but still continue to have the double vision, mostly when trying to read. Since my last surgery a year ago the double vision has not subsided and at my last visit to the specialist (last week) she seems to think that it may be starting up in the right eye now. I now have an appointment for more testing on the right eye. Maybe if we do it now, it can be controlled with the steroid injections. Just like in the left eye, there are no guarantees. I wonder if anyone has the same problem with their vision, the bulging eyes, and the depression. I sure could use a friend. I have had hypothyroid since I was 14 and now 34 years old. My life hasn't been easy physically or mentally. At age 18 somehow I had hyperthyroid and when I was pregnant with my son I was thyroid free but told it would return which it did. I get migraines, suffer from brittle hair and dry skin, horrible weight gain, joint pains, can't focus and always fatigued. I just take my medication and take it a day at a time. As I get older it gets worse. It may just be a disorder, but it truly can affect you if not managed properly. So I've had hypothyroid for 20 years. Although it's an everyday struggle energy-wise to get through the day, I am thankful I can still do things. My thyroid test came back high so my doctor is putting me on medication. I have swelling in the left side of my neck, I am worried that it is a thyroid disorder. Throbbing pain in the thyroid region, intermittent, woke me in the night recently. I am a female, 46 year old. I am a very active person. I go to the gym minimum 5 days a week and take kickboxing 3 times per week. My eating is very healthy and I barely eat any sweets. However, I have been noticing very rapid and uncontrollable weight gain over the last 6 to 8 months. My heartbeat tends to slow down and I get some palpitation on a few occasions. I tend to get depressed very frequently. I visited my doctor and was told thyroid count is lower than usual. He put be in a low dose medication, but one of the side effects is hair loss. I am very concerned. I do not like taking or depending on medicines that will trigger other problems. I need to know if there is anything I could do naturally. I am speaking for my daughter. She's 15 years old. She was diagnosed with thyroid disease The doctor referred it as toxic thyroid since her thyroxine level went down to zero. She' taking medications and the doctor had suggested for her to take radioactive iodine. Accordingly it is safe. But I still have doubt about it. She is only 15 years old. Thank you very much. Last week I had my thyroid removed. I have a follow-up appointment with both my surgeon and my endocrinologist, but that is a week away. I was and still am wondering what it meant when after the surgery I was told that my thyroid was unusually small in size. My thyroid was covered in nodules and pathology will examine if they are benign or malignant. My voice is deeper and very robotic sounding. I feel like I have been through a lot these past 2 plus years. January, 2007, I had a triple by-pass. I have had low energy for months and have been very sensitive to the cold. At age 48 I was diagnosed with Hashimoto's Disease, which is a form of hypothyroidism. Every time I think about this, my blood pressure goes through the roof because I had the classic symptoms for almost 10 years before any doctor thought to order a TSH test. At time of diagnosis, it came back with a reading of 160! I asked how I could even function at that level and my (new) doctor replied that, o, the body just gets used to it. My ongoing symptoms were extremely dry skin and hoarseness/laryngitis that would come and go spontaneously. One minute I could talk, the next minute I couldn't, and 10 minutes later I could talk again. And, yes, I experienced early menopause. Along the way, doctors kept asking if I were unusually tired. That was the wrong question to ask. I had jobs in which I might easily put in a 10-hour day. I didn't feel particularly tired. The fact that I was going to bed earlier and earlier I just chalked up to getting older (and getting up at 6 AM). By my mid-40s I was getting unusually cold in the evenings - even when other people in the room said the temperature was comfortable. I bought a sweater. Eventually, I had difficulty swallowing - it felt like a big apple had lodged in my throat. When I was finally diagnosed, I looked up Hashimoto's Disease on the Web and discovered that about 10% of women over the age of 40 develop this condition. So why did it take years for any of my doctors to order a lousy $40 blood test? (I had a number of doctors because I had moved several times. But nevertheless, each one heard my symptoms in detail and either wrote it off as a whiny woman complaining or viewed each symptom separately without looking at the cluster of symptoms together. You don't know the number of different dry skin creams I tried - with no relief.) The moral to the story: insist that your doctor order a TSH test as part of your annual exam regardless of your age! Additionally, don't let doctors bully you with numbers once you do get medication. Even though my TSH tests came back in the normal range after being prescribed Synthroid/Levoxyl, etc. I still didn't feel "normal" and my skin was still very dry. I read about Cytomel and was all set to argue with another new doctor to prescribe it, when he said that he always prescribes Synthroid/Levoxyl in combination with Cytomel. What a difference it has made over these past few years. I have hair loss, weight gain and all the usual symptoms of thyroid problem but I was not prepared for seven months and counting of numerous severe muscle spasms that interfere with daily life and safety factors when driving. Nights are pure agony. That's when they are the worst. Every movement in sleep causes a spasm that needs immediate attention by jumping out of bed to stretch and hold it and hope it doesn't take fifteen minutes. I grit my teeth to keep from screaming from the pain. My neurologist says it is thyroid. I don't get to see an endocrinologist for another twenty days. The spasms are getting worse despite Neurontin and baclofen being increased. I am scared. I am always hot and sweaty in the morning till I get to work and my air conditioner. I have started taking my temperature first thing in the morning and it ranges from 36.9 to 37.2 from Monday to Friday. My mother has had her thyroid removed at an early age. I am on great dilemma about thyroid. My mother is a thyroid patient and due to thyroid she has monthly menstruation problem. After taking 3 months medicine she didn't suffer from menstruation problem but now her belly is going bigger day by day, she is not pregnant too. I don't know what I should do. The doctors also couldn't give the proper conclusion if it is really a symptom of thyroid. I was diagnosed with hyperthyroidism as a 12 year old. I had a goiter and it was removed, now I am considered hypothyroid even though my T4 level seems to be fine on recent blood work. I have been experiencing a fluttering feeling in my neck and rapid heartbeat on occasion. I am now 43 and have been treated since I was 15. I am suffering with overdose of Thyronorm capsule, which was prescribed to me to take during my pregnancy. Now I am facing problem of black patches in front of my eyes, overweight, and vibrations inside the body parts. I've been experiencing these symptoms – fever, dehydration, rapid heart rate, nausea/vomiting, diarrhea, irregular heartbeat, weakness, fever and disorientation. I had the nodules removed last year. I'm on 0.1mg thyroxin and calcium. I feel I'm at a dead end. I can't carry anything heavy. I explained to a doctor from SOPD (specialist out-patient department) that my throat is dry, that I feel like I'm being throttled. The response was it's a healing process. I have such a strange story to tell. I fell down the stairs at my work. I broke my tibia and was on crutches. When I came off the crutches and started to put weight on my leg my knee started giving me a lot of pain. I went to a doctor who ordered a scan of my knee and as a result of this was scheduled for arthroscopic surgery. When they opened my knee up they discovered that it had been eaten away by these crystals. I was diagnosed with pseudo gout calcium deposition disease. They repaired the knee as best they could. I was then sent for tests for my para-thyroid because my calcium levels were very high and they needed to find out what was feeding these crystals. End result was I had to have a parathyroidectomy where both of my glands were removed. I am on coxflam and colchicine as well as arthro guard and omega oils. My recovery has been slow but I am on the mend. I was told that if I had not fallen down the stairs like I did, none of this would have been discovered. My son has a thyroid problem that is causing him to keep getting kidney stones. If he doesn't get better he may need surgery. He was also told only 1 day a week he can have red meat. I have hypothyroid disease. I gain weight even if I eat like a bird. I have weight gain, insomnia, sweating, and fatigue due to thyroid disorder. I"m always feeling tired and sweaty and I have memory loss, dry hair and extremely dry skin because of thyroid disease. I've been told that I have Graves Disease. We are looking to do a Iodine test to see if my growths are Cancer or not and how bad my Thyroid is doing. Anyone do the Iodine test and how did it go? 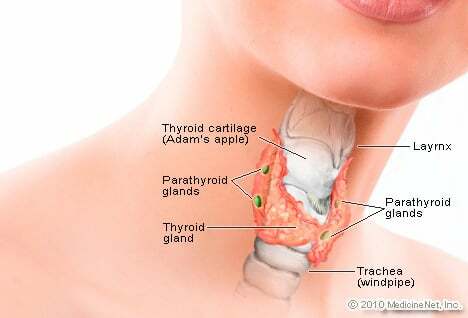 I have a thyroid disorder. I was always super tired, constipated, my hair falls out, I get depressed, have dry skin, rashes, weight gain – the list goes on. I am going to try to see an endocrinologist and hopefully this doctor can help. I wish there was a cure. I am tired of not feeling well. I finally was diagnosed with thyroid disease, after a year of suffering with sinus and throat problems. I was put on Synthroid. Now I am having twitches throughout my body in my neck and legs. I had every type of doctor trying to find out why this is happening. It may be that I have an allergy to this drug, and they are looking into putting me on dedicated thyroid. For people who are lactose intolerant it may be important to know that Synthroid has lactose in it. I hope this will make a difference for me. For now the twitching in my body goes on. I am also in my menopause and reading some literature the twitching could be a factor. When I started thyroid medications for my low thyroid several years ago, the nurse said, I would have so much more energy. I am diabetes II and have lab work every few months. I always ask my GP about the thyroid and she says it is okay. Now in talking to 2 different women, one of whom lost a lot of weight quickly, their doctors increased thyroid medications and they got better. Tomorrow I have an ultra sound of my thyroid. Maybe cancer, maybe not. Since I am having L mastectomy on Aug. 21, the cancer surgeon is covering all bases to make sure she knows what else is going on. I am tired a lot, sometimes worn out by supper and can't cook. I have to fix simple things. The daily naps my GP suggested, I am 76, don't help the tiredness. So if I need more meds for it I know the cancer surgeon will prescribe. My daughter suffers from fatigue, hair loss, constipation, and being cold all the time. She has thyroid disease on both sides of her family with three Aunts and one cousin, both hypothyroidism and hyperthyroidism. Tests have been mostly normal, some borderline. Her hair loss is getting severe as well as her fatigue. I was diagnosed with hyperthyroidism over active thyroid in March. This year for a year and a half I was just putting weight off and could not understand why, I went from 120 pounds to 96. It was good for me because I was also trying to lose weight, until one day, I new this was not right, I went to my doctor and told her why was I was losing too much weight. I had blood work done for thyroids, so I was told I had graves diseases. Now I'm taking synthyroid 75mg. I've been on it since June 2nd. I can't seem to get the weight off. I pee a lot. I can't go to the bathroom like normal I have to take miralax to go in the mornings. I have a kindergarten age grandson with very strong body odor, decreased mental alertness, big and tall for his age (not fat at all). He can't seem to get enough to eat and will even eat food from the floor. He is incontinent of bowel and bladder when he sleeps. This child will do things when told only one time and is very smart. He's not hyperactive at all. Thyroid disorders run in my family. I often complained of being tired and cold, but my doctor could not find my problem until I found out that hypothyroid problems run in my family. I was tested and found my TSH was extremely high. I was put on medication until my basil body temperature was normal. When I was forced to change doctors my new doctor did not go by basal body temp. He only went by the TSH results and lowered my meds three times. I still feel OK except I am extremely cold now and my hands often turn blue and some of my fingers turn white and hurt. I have complained of being cold, but my doc said my TSH is in the normal range.